Showing results for tags 'dog'. Which one will you choose, Dog or Cat? 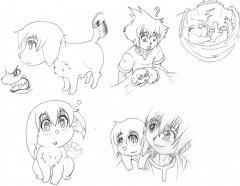 She's Sora's adopted puppy he found on the streets. © Kingdom Hearts and Soul Eater are both licensed by Square-Enix. The secondary licenses for both franchises are Disney (Kingdom Hearts), Aniplex, Bones Inc., and Funimation (Soul Eater). © 2008-2019 KH13, originally created by Daniel Chiuchiarelli and Aaron McNabb, and contributed to by KH13 staff. Original KH13 content can be shared under the Creative Commons license, with attribution. Kingdom Hearts and all official Kingdom Hearts material is © Disney and Square Enix.